This is a very minor version bump that fixes a few bugs in the new log viewer and completes our migration to Swift 5. 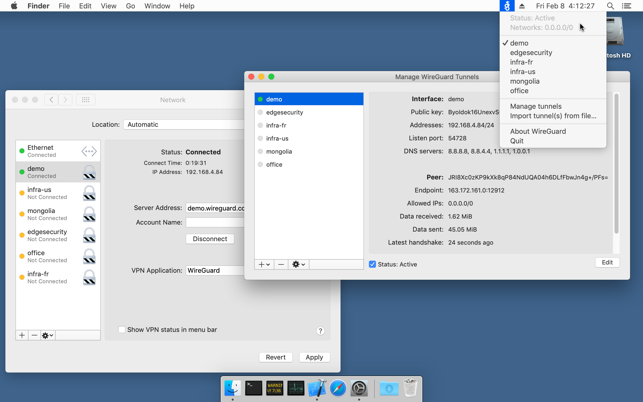 I have been using OpenVPN, Tunnleblick, and Wireguard with two different VPN services and have found WireGuard 1.02 to be the easiest to set up and fastest to connect on Mojave. The slower to connect of my two VPNs sometimes takes over a minute to establish a VPN tunnel. WireGuard does its thing in less than a second, connecting to the same VPN service. And it is equally fast on my iPhone 7. Thanks, guys!